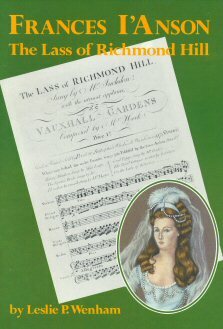 "Sweet Lass of Richmond Hill"
words by Leonard MacNally (1752–1820), tune by James Hook (1746-1827), an English composer, and was published circa 1790. "I'd crowns resign to call her mine Sweet Lass of Richmond Hill." A small book of 48 pages, 13 illustrations and 3 pedigrees, entitled "Frances I'Anson, the Lass of Richmond Hill" was written and published by Leslie P. Wenham after many years researching the subject. L.P.Wenham was born in Richmond, Yorkshire, educated a the local grammer school, and graduated from University College, Durham. Until his retirement he was Head of the Department of History of St John's College, York. He was a Fellow of the Society of Antiquaries of London, Chairman of Richmond and District Civic Society and Honorary Curator of Richmondshire Museum (of which he was one of the founders). Thus, we can expect his work to be an authoritative and valid report of his researches. A musical "Sweet Lass", was performed in Richmond in the 1970s, telling the story of Frances I'Anson. A transcript is available to download here as a PDF file. The script was by Ken Wadsworth and Angus Goodfellow, the songs by Brian Holdsworth. Francis I'Anson died in Dublin in 1795, the wife of Leonard MacNally the author of the ballad. 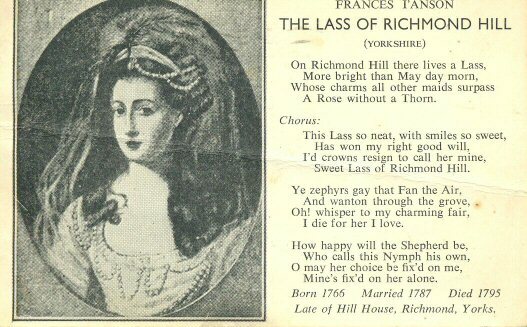 Since that time controversy has raged as to where she was born, the location of the "Richmond Hill" of the song (whether Richmond in Yorkshire or Richmond in Surrey); the authorship of the ballad, the composer of the music, and whether Frances I'Anson was, indeed, "the Lass". The claims that she was "the Lass" are considered substantially proven but other aspects of the legend are challenged, especially her known associations with the two Richmonds. She is alleged to have lived in Hill House in Richmond, Yorkshire, a house that has other claims to fame. 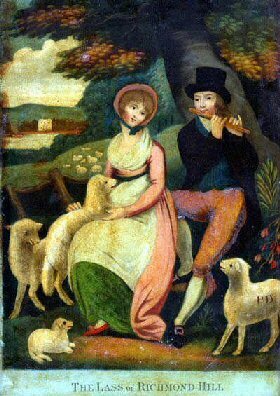 It is also associated with the Millbanke family, one of whom (Annabella) married the poet Lord Byron (one chapter of Wenham's book is devoted to this link). Another legend is that the artist Turner deliberately included "the Lass" in some of his watercolours of Richmond, Yorkshire. She descended from William I'Anson of Hauxwell, brother of Sir Henry I'Anson, 2nd baronet. William married Abel Wyvill of Constable Burton Hall, in 1662, and their eldest son was named William. He, too had a son, William, the grandfather of Frances I'Anson. Frances's father was yet another William I'Anson who married Martha Hutchinson of Hill House, Richmond. Thus, Frances's connection with Hill House seems to be established. She married Leonard MacNally in 1787 at St George's Church in Hanover Square, London. They had three children: Frances, Elizabeth and William. She died in Dublin 30 Sept 1795. 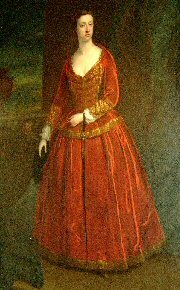 Artist Unknown The Lass of Richmond Hill, Date Unknown. Glass Painting. 10 x 14 in. (25 x 36 cm). Reverse engraving on glass, coloured from the rear of the engraving. William M. I'Anson, "The Lass of Richmond Hill" in Yorkshire Archeological Journal, 1924. J.Coventry I'Anson, "The Lass of Richmond Hill" in Gentleman's Magazine, March 1904.
suggested Turner's intention to depict The Lass in his watercolours of Richmond, Yorks. I have Wenham's booklet, and corresponded with him, but do not agree with his conclusions. I also corresponded with some I'Anson descendants to establish the I'Anson tree which I have included in "J.M.W.Turner's Tonbridge & District" (2nd ed., September 2007, £15), which shows the Turner connection. (to enlarge, click pic) I recently went to Richmond North Yorkshire and visited the Kings Arms Pub there. They very kindly let me take some photographs of their painting of Frances I'anson - The Lass of Richmond Hill. I thought I would forward you a copy to display on your I'anson website.